Individual Smoked Duck Lasagnas. 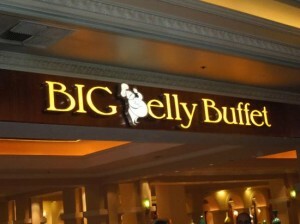 For Valentine’s Day dinner this year, I wanted to try something special. One of my husband’s favorite dishes is my White Lasagna. This time, I chose to use my husband’s house-smoked duck in the recipe. I changed the spices a bit as well. This is NOT a low calorie dish. Smoked duck, Comte cheese, goat milk yogurt, and rehydrated dried shiitake mushrooms are used as fillings in the lasagna. 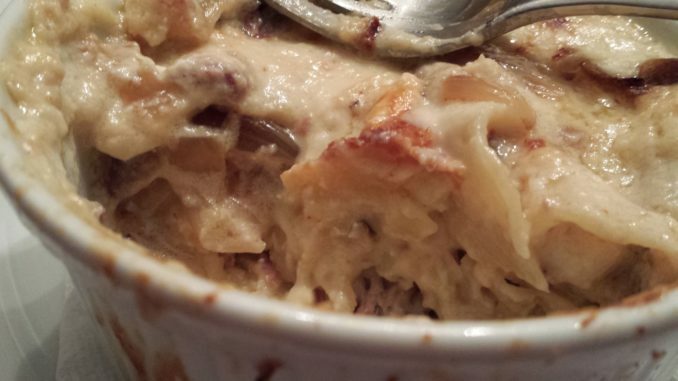 The individual smoked duck lasagnas are then smothered with a creamy white sauce. This time, I didn’t take photos of the steps in the recipe. It’s not hard to make this lasagna — it’s just time-consuming but well worth the effort. And you will impress your dinner guest(s). Hydrate some dried shiitake mushrooms in a cup of water. 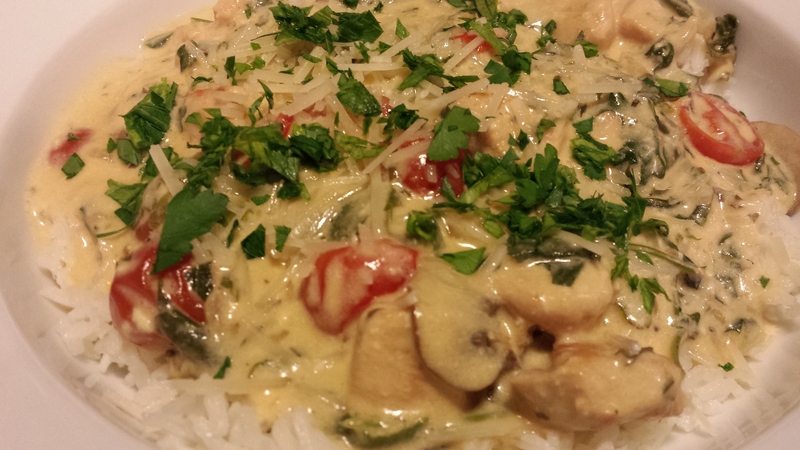 You could use fresh mushrooms but I like to add the dried shiitake mushroom liquid to the white sauce. Make a white sauce with milk, flour, bay leaf, shallots, and a French paprika seasoning called Piment d’Espelette and set aside. Saute onions and chopped hydrated shiitake mushrooms in some butter. Make a filling of shredded Comte and Parmesan cheeses, and goat milk yogurt. Cover the bottoms of two ramekins with the white sauce. 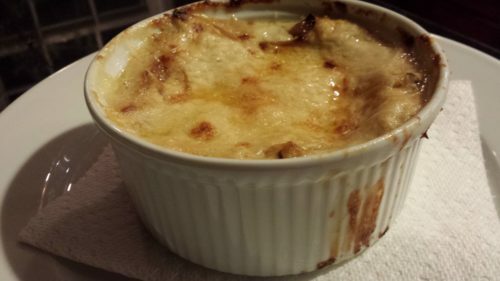 For each ramekin, layer half of a no-boil lasagna sheet on top of the white sauce. 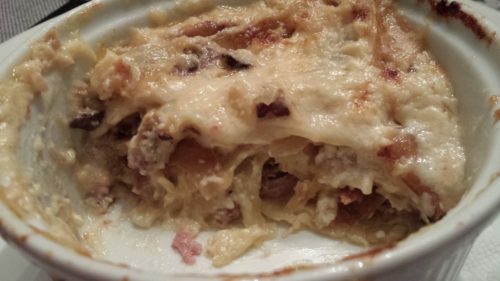 Sprinkle some shredded Comte cheese, the cream cheese cubes, and the smoked duck over the bottom lasagna half-sheet. Add some white sauce and top with another lasagna half-sheet. Spread the Comte and Parmesan cheeses and goat milk yogurt mixture over the second lasagna half-sheet. Add a third lasagna half-sheet and spread the mushroom and onion mixture and sprinkle with shredded Parmesan over that sheet. Add another slathering of white sauce and top with the fourth lasagna half-sheet. Divide the remaining white sauce between the lasagnas to top the lasagna sheets. Bake the lasagnas at 350 degrees Fahrenheit for an hour or until the lasagnas interiors reach 170 degrees Fahrenheit. The tops should be golden brown and bubbling but if they are not you can set them under the broiler for few minutes. Remove the lasagnas from the oven and let sit for 15 minutes. Then serve! 2. Chop the drained hydrated shiitake mushrooms. 3. In a non-stick skillet over medium heat, melt the butter. 4. When the butter is bubbling, add the onions. When the onions are caramelized add the mushrooms and warm through. Remove from the heat and set aside. 5. Make the white sauce by heating the butter in a chef’s pan over low heat. 6. When the butter is melted, whisk in the flour. Cook two to three minutes, stirring with the whisk. 7. Add the milk and continue to whisk until smooth. 8. Stir in the chopped shallots, the bay leaf, and the pimente seasoning. Let simmer over medium low heat until the white sauce thickens. 9. Add the reserved mushroom liquid, whisking until the sauce thickens slightly again. 10. Remove the bay leaf and set the sauce aside. 11. Make the cheese filling by mixing 1/4 cup of the shredded Comte cheese with 1/4 cup of the shredded parmesan cheese, the plain goat yogurt, and the grated nutmeg. Set aside. 12. Lightly grease two ramekins with cooking spray. Spoon some of the white sauce into the bottom of each ramekin. 14. Ladle some more sauce onto the noodle. Then divide the smoked duck and a sprinkling of shredded Comte and the cream cheese cubes over the sauce in each ramekin. 15. Place a second no-boil lasagna noodle over the duck layer. 16. Evenly spread the cheesey yogurt mixture over the second lasagna noodle. Top with a third lasagna noodle. 17. Ladle some more white sauce over the third lasagna noodle. 18. 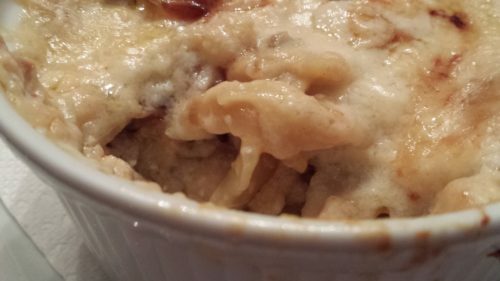 Divide the mushroom and onion mixture over the white sauce in the ramekins and sprinkle the rest of the shredded Parmesan over the mushrooms. 19. Top with the fourth lasagna noodle. Ladle the rest of the white sauce over the top of the fourth noodle. 20. 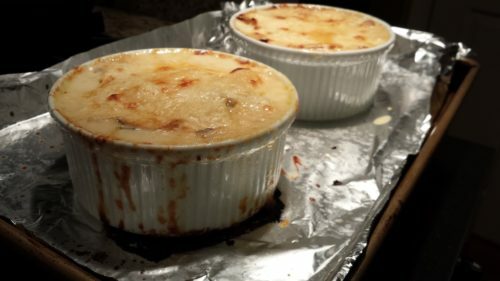 Put the ramekins onto an aluminum foil-covered baking sheet to catch any overspills. 21. Bake at 350 degrees Fahrenheit for about an hour, checking to be sure internal temperature reaches 170 degrees Fahrenheit, and the top has browned. Check from time to time to ensure the bottom has not over-browned or burned. If the lasagnas are done, you may want to broil the tops for that nice golden brown color. 22. When the lasagnas are done, remove them from the oven and let sit for 15 minutes. Makes 2 portions as an entree. This lasagna is great with a side salad such as my Granny Smith Apple Chopped Salad with Goat Cheese and Toasted Pecans. Red or white wine pairs nicely with this dish. Variations: Use regular cooked duck meat or smoked or regular cooked chicken if you can’t find smoked duck. You could try smoked turkey or smoked pork. Use regular plain Greek yogurt if you can’t find plain goat milk yogurt. Try different cheeses depending on your preferences and what you think goes best with smoked duck. Buy some smoked duck breast from D’Artagnan. Just chop the refrigerated meat when you are ready to use it as it’s fully cooked. 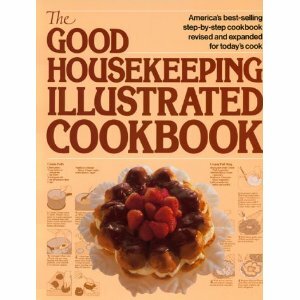 What’s Your All-Time Favorite Cookbook?